Defamation claims are prosecuted in Florida courts based upon written statements or verbal statements that arguably “defame” someone in some way. In both libel (written defamation) and slander (spoken defamation) lawsuits in Florida, the plaintiff asks the court to award actual damages (proven expenses resulting from the defamation) as well as punitive damages (damages assessed as a “punishment” for the wrong and a public deterrent against others doing it in the future). Internet and Social Media Defamation Lawsuits – What Happens Once the Lawsuit is Filed? 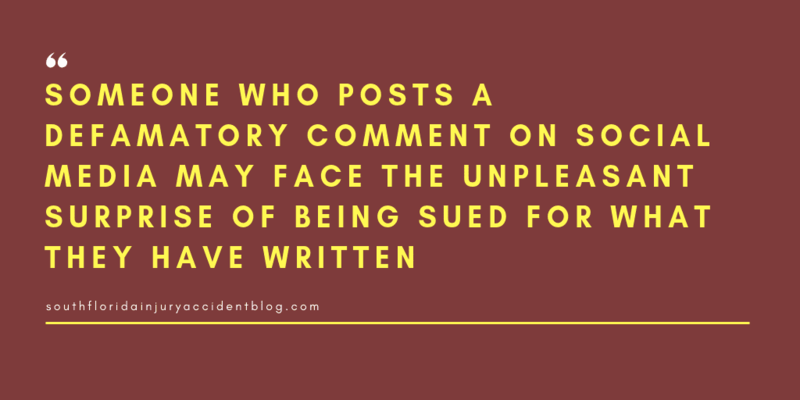 Someone who posts a defamatory comment on a blog or on a social media site, as well as someone who chats away on YouTube or other web video, may face the unpleasant surprise of being sued for what they have written or said on the internet. When a plaintiff files a defamation lawsuit in Florida, the defendant cannot block his or her name from being recorded in the permanent court records as a defendant in a civil action. Once the defendant is served with the lawsuit, the defendant must file an “answer” to the lawsuit within 20 days of being served. The answer is the defendant’s formal response to the claims asserted — it is here that the defendant sets out the legal bases for why the plaintiff’s requests for damages from the defendant should be denied. Generally speaking, the defendant will deny the claims made by the plaintiff. By doing so, the plaintiff must then provide admissible evidence to prove his or her case. However, and especially important in defamation cases, Florida defendants can assert “affirmative defenses” to the plaintiff’s claims. These are legal bars to the plaintiff’s request for damages. Telling the truth was given constitutional protection against someone’s claim of libel or slander (defamation) long ago by the United States Supreme Court in the landmark case of New York Times v. Sullivan. In that case, the Supreme Court found that the federal constitution’s guarantee of free speech meant that defamation cases needed to have protections in order to insure the flow of truthful communications in the United States and to protect public debate about issues. Truth has been held to be an absolute defense to a claim of defamation based upon this federal case, except when it’s not. However, over time, states like Florida have been faced with situations where justice and fairness require that other considerations apply — telling the truth may not be enough to block a plaintiff’s claim for damages in Florida. Here, truth as a defense may need to be accompanied by evidence of things like the speaker meant well and that the speaker had a justifiable reason for saying or writing the statement that is now being argued as being defamatory. What affirmative defenses apply to the specific defamation case will depend upon its unique circumstances. It is wise for someone who believes that they may be facing claims of libel or slander under Florida law to consult with an experienced defamation lawyer in order to learn the specifics of their case and the strengths and weaknesses of both the plaintiff’s case and their own defenses. Florida Defamation Lawsuits: What are The Defenses to Libel and Slander Claims Seeking Damages Under Florida Law? Defamation Claims In Divorce Proceedings or Between Ex-Spouses – Do You Have a Libel or Slander Lawsuit Against Your Ex?